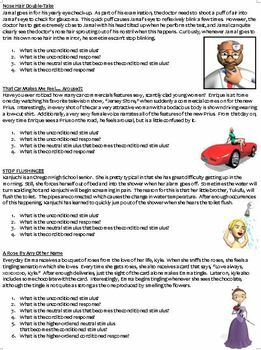 After learning about the classical conditioning process, students can be given this worksheet in aPsychology/AP Psychology class for practice. There are seven problems in total, and they are all unique real-world examples of how classical conditioning works. There are images included for each question as well to give the worksheet more of a "visual" feel. Answer key is attached. It's winter time for Rylai! Although she lives in South Carolina, an unusually cold winter has caused a snowfall in January. Rylai goes outside and immediately regrets her decision. The extremely low temperature causes Rylai to shiver in an attempt to warm her body up. As this is happening, Rylai also sees her first snowfall as small crystal flakes drop from the sky. As the harsh winter continues, Rylai notices something else as the weeks progress--sometimes when she wakes up in the morning and sees snow outside her window, she shivers even though its 75° in her room! 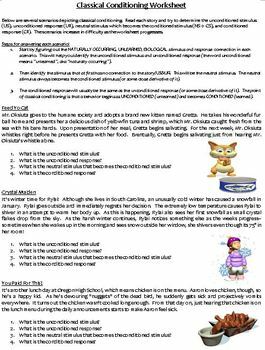 The companion PowerPoint lesson I use to teach classical conditioning can be found here, if you are interested.